One of the great things about Social Media is the randomness of things. 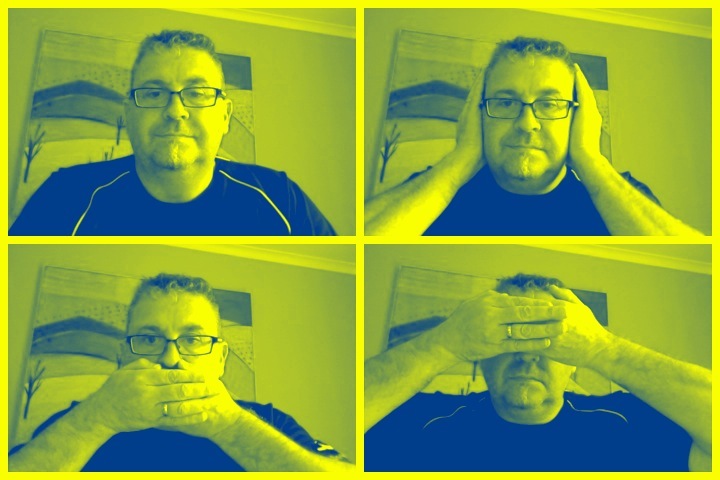 Sometimes it veers off to the ‘social’ as it is supposed to be. Yes that a Tuatara Bottle on the right, not only a micro brewer but environmentally friendly too. Clements and Daughter, based in Wellington. First the Backgaarden Witbier a Witbier style . 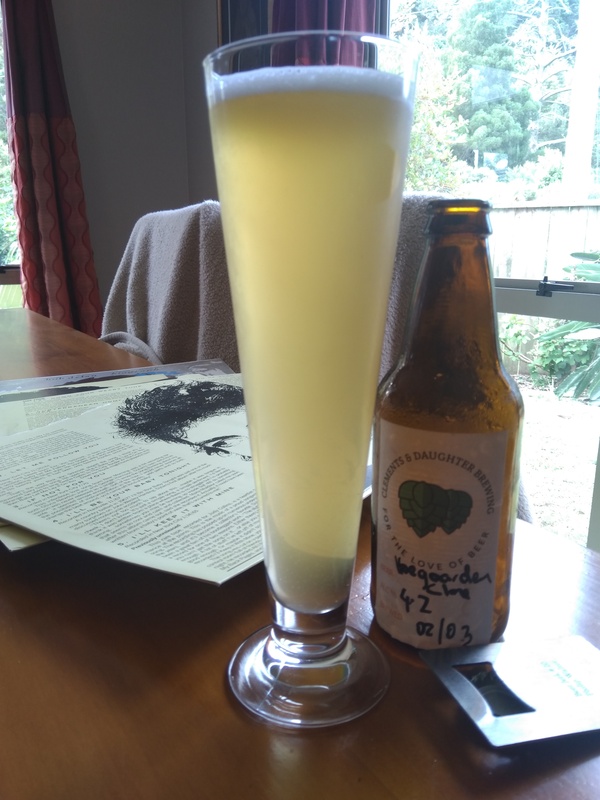 A 330ml bottle that has beer of 4.2% ABV, so this is 1.09 standard drink units in NZ. First try at a wheat beer, a Hoegaarden clone. Came out really well and great orange, banana and bubblegum flavours. Hope people enjoy it. Brilliant aroma on opening, as it did with a nice hiss of carbonation, pour is outstanding, cloudy yellow golden with a head that is bright white and persistent. In the glass the aroma is just as lovely, with that soft Belgium yeast bubblegum hint. 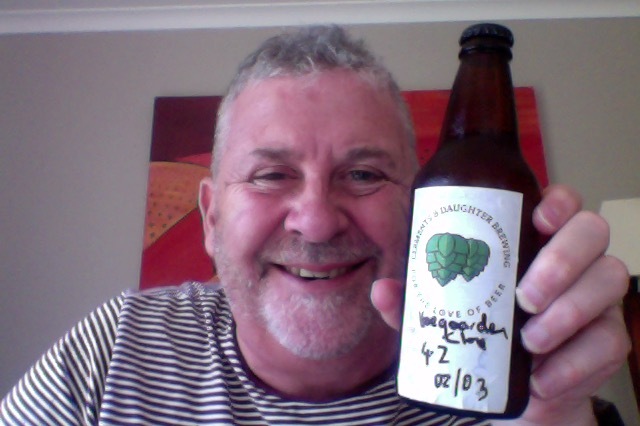 This isn’t a commercial beer, it’s not a mass produced long shelf life product, it’s a home-brew, and it is outstanding. Choosing perhaps arguably the leader in that segment to mimic was a brave choice, which has paid off. The pdubyah-o-meter rates this as 9 of its things from the thing. This is properly nice and very pleasant beer, if you didn’t know it wasn’t the commercial version you’d probably struggle. Also I think that this is much better than some commercial Witbeir that I’ve had. Was a bit worried about this one as the grsins had been sitting for a month and I had forgotten them…but here we are and it’s a decent effort. Fruity, good taste and a little bit boozy. 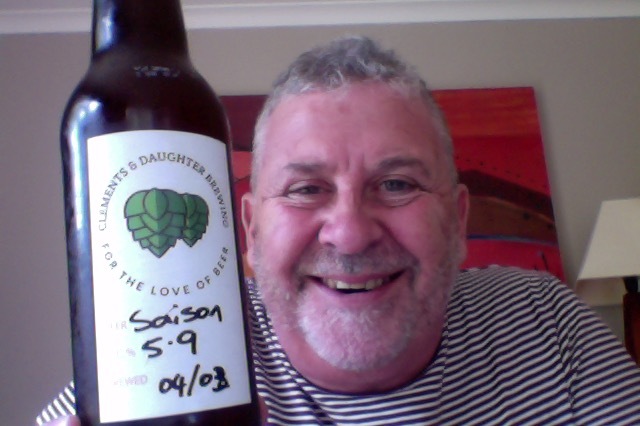 I love a Saison or Farmhouse ale, I think one of the first craft beers I brought was the 3 Monts beer, so they have a memory for me. Lovely on opening, although I thought it was more bubblegum than dust yeast that came forth. Lovely Bright Orange beer, list on carbonation as you expect, the aroma still leaning on that Belgium yeast bubblegum. Looks amazing though. Truly lovely beer. This honestly does not taste like a Saison, which I expect to be mustier/dustier in many ways, this is much brighter and more towards a begum strong ale possibly. Nothing wrong with that though as this does drink rather well, a lovely level beer that doesn’t have any sharp peaks or dips, and importantly doesn’t veer off with that alcohol tang at the end that you sometime get. This is like a dark version of the Hoegaarden, in some ways comparable to the Lefee Blonde and Laffe Bruin, where I prefer the Bruin. Taken at face value and from the brewer, this misses the mark as a Saison, in my opinion, but somehow gets closer to a bullseye on the scheme of things. As a beer this is quite sweet and it might be hard to have a couple of these without looking for a side bar of something to get your taste buds back into line. I’ll tell you what though this is chuffing excellent beer of the first class whatever it is. The pdubyah-o-meter rates this as 9 of its things from the thing. Two in a row at 9. What a time to be alive. I did think that this ended up more towards an Abbey Dubbel than a Saison, which I could be dead set wrong about, but I’d never pick it as a Saison, perhaps a Belgium Strong ale, it’s difficult, I’m not an expert. Pour is a muddy brown affair that seems to be under-carbonated but ir musters a head that starts with good intentions and then faded to a sulking film to one side. It looks flat in the glass too. Aroma in the glass is a beer that has a chocolate or burnt oat about it and a milky softness on offer. The taste, starts well, with a understated fruit note that’s carried on a soft pillow that offers to look and fill out but don’t quite get there, leaving this a little under bodied or thin, which could be that there was a worry at the lactose stage perhaps. So a lack of fullness or mouthfeel are the worst things that I can say about this beer, and when I read the brewers notes I now see where I’d gone off track, because they’ve added the hint of lactose. 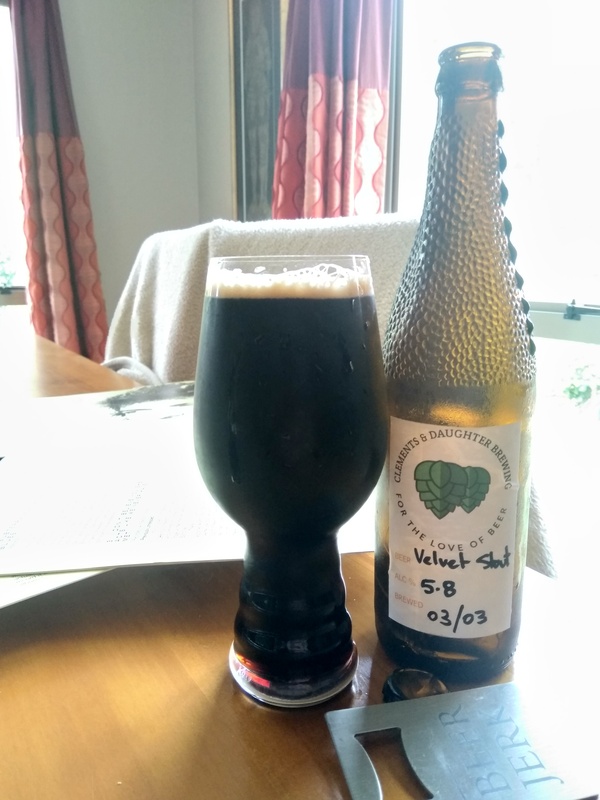 As it warms the other things in this beer being to come forth, there’s a familiar edginess in this in the lingering notes, there’s a lovely fruitless in the initial sup, and things you expecting a stout, that slight bite, a little fight are there, they could be brought more forward of course. I’d like it be be fuller in the mouthfeel, but I really like that burnt note on the palate and that lovely chocolate on the nose. The pdubyah-o-meter rates this as 9 of its things from the thing. This is beer that is the equal or better of many commercial version of this style, and does not pretend to be something it isn’t. I think I’d like more mouthfeel, but I wouldn’t want to take away from that edgy carry, and there’s plenty of sweetness and things to enjoy elsewhere. Where did I get it? Direct Delivery from the Head Brewer, probably didn’t ask the Daughter. Would I have another? I should be so lucky to get more. Would I share with a friend on a porch and set the world to rights? I might have to move to be closer to my new best brewing buddy wherein I could be his head tester, but I’m happy being Auckland Ambassador. So here’s the thing, if I didn’t like them I’d be telling you they were awful or where I thought they didn’t work. 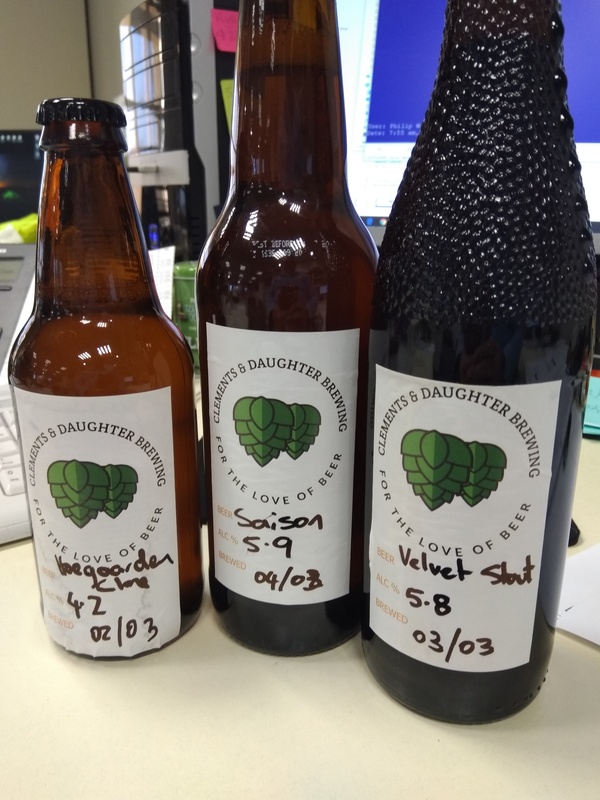 All three were properly nice beers that I would pay money for, and in some instances I’ve paid money for commercial variations that have been a bit regretful. 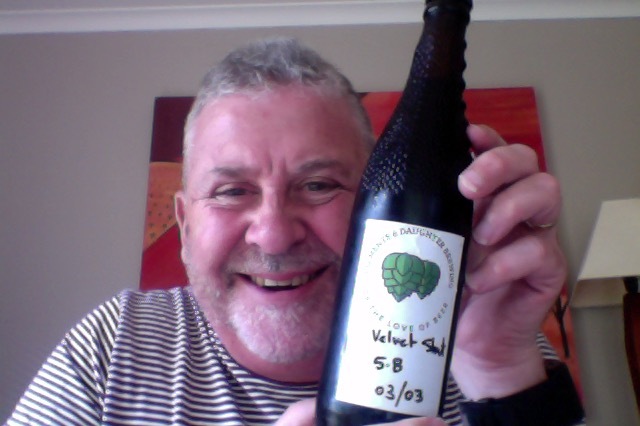 For me the Saison, or whatever that turned out as, was the beer of the three, the Stout was really good and it’s neck and neck, but that BackGaarden was pretty special and I’d be chuffed if I’d brewed that. There’s nothing in it though, brewing at this level can’t be a fluke or luck, thank you for indulging me. 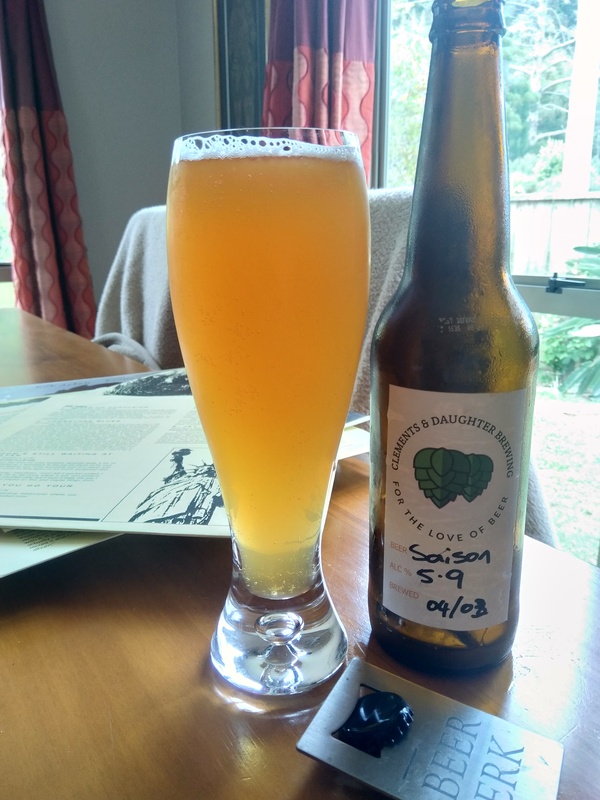 This entry was posted on March 24, 2019 by Philip Walter in Beer, Beer of New Zealand, Beer Review, Clements and Daughter, Craft Beer, Critic, Saison, Sweet Stout, Wit Beer and tagged Backgaarden, Clements and Daughter, Homebrew, Saison du Garage, Velvet and Candy.